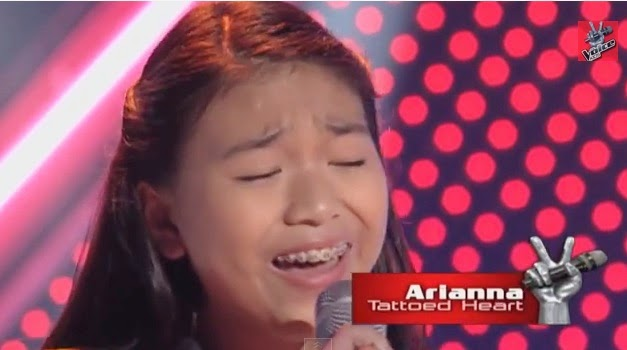 Manila, Philippines - Arianna Ocampo performed Ariana Grande's song "Tattoed Heart" during the blind auditions of ABS-CBN hit singing reality show aired on Sunday, June 1, 2014. Arianna wowed the judges with coach Lea Salonga immediately turned her red chair followed by coach Sarah Geronimo and Bamboo Manalac. Arianna is the 5th 3-chair turner on The Voice Kids Philippines. Other artists who are included in the elite list of 3-chair turners are Jimboy Garcia, Darlene Vibares, Nathan Bautista and Echo Claridad. As of the June 1 episode, 21 artists have already convinced at least one coach to turn around, with 6 hopefuls getting a slot in Team Sarah, 7 in Team Bamboo, and 8 in Team Lea. The Sunday's episode of 'The Voice Kids' dominates online conversations with 'Go Karla', 'Tattoed Heart', 'Genmarie', 'Rommel' and 'Greatest Love' among the trending topics. "The Voice Kids," hosted by Luis Manzano and Alex Gonzaga, airs Saturdays at 6:45 p.m. and on Sundays at 7:30 p.m.